Bestech Australia teams up with NIDA Corporation offering hardware as well as support programs for training of electricity, electronics, and electro-mechanics in an ever-expanding number of technical disciplines. From aviation electronics to renewable energy systems to industrial instrumentation and controls, Nida basic and advanced training programmes are utilised daily by thousands of students around the globe.The Nida training system from Bestech Australia is a performance-based system ideally suited for conventional classrooms/ laboratories, e-learning programmes, and blended learning training environments. The systems have been supporting TAFE, post-secondary technical, University, military, and industrial training programmes throughout Australia. 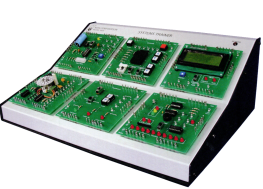 – Circuit Cards emulate circuitry found in industry and technical applications. 710A Computer Controlled Electrical Training and Assessment Panel. Testing and Verification to UEENEEG105A, 35 Faults Give Thousands of Faulting Scenarios, Remote Capstone Test Software Available. The technical training hardware, learning content, and interfacing software designed by Nida provide an interactive, objective-based program of technical study. The web-based, computer-delivered learning content deliver theoretical concepts and principles, hands-on experimentation, that both knowledge and practical skills of each subject are developed and assessed following a logical guidance. The theoretical learning content includes graphics, animations, simulations, random questioning, and help routines providing visualizing learning activities to support tutors, and that is followed by practical exercises and experiments to reinforce the concepts the tutors have just taught. Knowledge and skills assessment module ensures the student has mastered the objectives before moving on to the next topic of instruction. To facilitate learning plans, Nida training system software offers thousands of hours of computer-assisted, modularly designed, learning content that can be mixed and matched to align with any technical training or engineering program. A comprehensive student monitoring system and learning management system relieve the lecturers of mundane management processes and allows them to have more time teaching, assisting and supervising students. From students prospective, they enjoy learning on the Nida training system because it offers a complete blended learning package that promotes most learning styles. Lab/text manuals provide research material whilst the computer-based theoretical content, systems thinking questions and topic-related exercises complete the learning process of the topic and provide instant learning results. Students enjoy learning by doing and the Nida training system excels at providing hands-on experiments to support every new concept. Whether it is a quick skills upgrade class or a complete course of study, the Nida technical training systems are developed to make the teaching experience more effective and enjoyable for both teaching and learning parties. Nida Corporation hardware, trainers and experiment card sets, are constructed of the highest quality materials. The trainer chassis are made of machined metal to ensure that they are rugged enough to stand up to daily student use. The trainers provide non-destructive faulting, power application control, and student protection that meets UL, CA, and ESV certification. The experiment cards are designed with self-cleaning contacts, open construction for real-life applications, and student-tested circuitry that emulate systems and circuits found in the technical workplace. Nida hardware from Bestech Australia is supported by a five (5) year warranty which is unprecedented in the training equipment industry, as we are confident in the soundness of the equipment and the concept of our design. It is convincible itself to encounter our 15-20 year old technical training systems in an electronics lab that are still utilized every day. Please complete the enquiry form below for specific information and advice on Electrical & Electronics.